House Speaker Shap Smith (D-Morristown), left, talks about plans to pass legislation next year requiring employers to offer paid sick leave, as Gov. 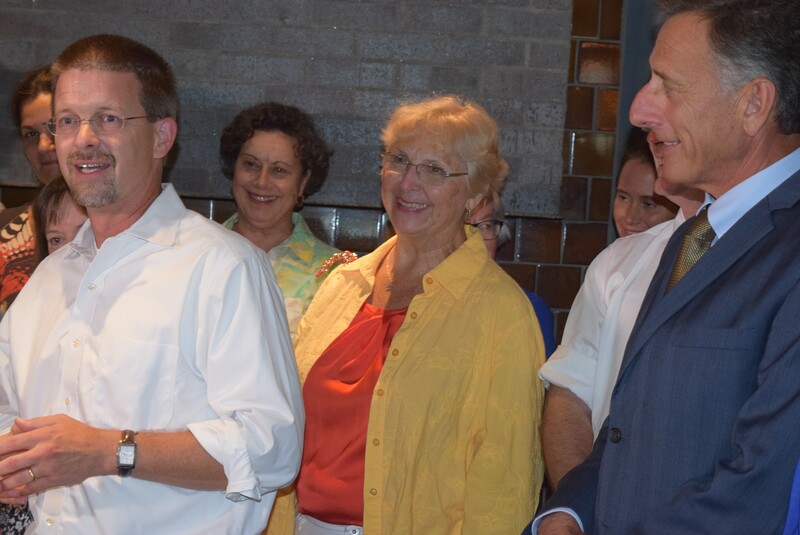 Peter Shumlin looks on Wednesday at Hen of the Wood restaurant in Burlington. When legislators return to Montpelier in January, one of the first orders of business will be to hold hearings on a bill that would require Vermont businesses to provide paid sick leave. That was a promise from legislative leaders and Gov. Peter Shumlin on Wednesday at a press conference at Hen of the Wood restaurant in Burlington, a high-end eatery where the owners said they offer workers 10 days of flexible paid time off a year. “We will be holding hearings immediately,” said Senate Majority Leader Phil Baruth (D-Chittenden), a supporter of mandatory paid sick leave. Baruth watched last year while the House narrowly passed a bill that fellow senators put on ice as the session ended. A Senate committee will start considering that bill in January, Baruth said. The legislation would initially require employers to provide at least three days of paid sick leave a year for full-time employees, upping the time to five days a year later. Last session, that bill failed to gain traction in the Senate, where President Pro Tempore John Campbell (D-Windsor) was among those who expressed concern the mandate would be a burden to employers. Campbell, who didn’t attend Wednesday’s press conference, said afterward he still holds those concerns, but has promised the bill will get a hearing next year in the Senate Economic Development Committee. Whether the measure will pass the full Senate is unclear, but there will be a large crew of people pushing to make it happen before the 2016 legislation ends. Supporters said Wednesday they want the bill to pass because they think it's good policy, but there are other factors at play in making 2016 a goal for the legislation. For Shumlin, the three-term Democratic governor who announced in June he won’t seek reelection next year, passing paid sick leave legislation would be one among a diminishing number of achievements he can add to his legacy before he retires. Advocates also can't guarantee the next governor will be as supportive. For House Speaker Shap Smith (D-Morristown), shepherding paid sick leave legislation into law would give him a solid bona fide Democratic issue to put on his resume, as he seeks the party’s nomination for governor. Regardless, Smith will be up against other Democratic candidates who support the concept. If he’s able guide the bill into law in 2016, that success will give him a boost in a Democratic primary race where the issue is likely to resonate. The Democratic Party put out a statement Wednesday declaring, "The Vermont Democratic Party supports earned sick days in our platform because it addresses both workers’ rights and public health." Former senator Matt Dunne of Hartland, who is also expected to seek the Democratic nomination for governor, said he “certainly” would support the bill that passed the House. The 72-63 House vote on the bill this year fell largely along party lines. Does that mean this issue could be among those that define the difference between Democratic and Republican candidates for governor in 2016? Not necessarily. If the bill reaches the Senate floor next year, Scott — who presides over the Senate — might have to decide if it offers enough flexibility to suit him. It's his job to break any tie votes. Whichever way the vote goes, it's likely to have an influence on the governor's race.